9th) What is a good RPG to play for about 10 sessions? Most. I’m slowly coming to the conclusion that around 10 sessions is a good length for a tightly focused campaign and that I like that fixed length. It gives you long enough for a proper plot arc, to get to know the characters and to give each time a fair amount of narrative spotlight. For longer open ended campaigns I think the focus can be lost while shorter doesn’t allow for enough breadth, everything has to be laser tight on a single aspect. I think ideally I’d aim for 3-4 sessions per player with a preference of 3-5 players. So a range of 9-20 sessions although that is of course just a guideline. For those sort of games it really helps to have characters that already have background hooks to latch onto and who are already connected to one another. Probably the best example of this that I’ve run was my Dresden Files campaign. Three players and around 12 sessions. Two of the characters started off working together while the first arc focused around the third character as their supernatural heritage manifested. The second arc then introduced the larger threat and the main macguffin (a newly born dragon) while the final arc required them to stop the summoning of an ancient forgotten evil. All of these were interconnected through the backgrounds of the characters and despite taking a while to get used to the system it remains one of the most satisfying campaigns I’ve ever run. One of the things that I’m particularly bad at when it comes to managing campaigns is actually writing things up in coherent blocks of text. Partially that’s down to the way I tend to make notes, haphazard and on the fly but it’s also because I’m not that great at concise writing or writing in general (one of the purposes of this blog is to provide me with practise at doing so). This obviously impacts on how I keep track of what happens in a campaign and once I get past 3 or 4 sessions I often find that I’m left with multiple bits of paper containing all the random notes I’ve scribbled down during play. One of the ways I manage this is through Obsidian Portal, but most of the time my wiki’s end up lacking and I really make most use of the character side of the site, allowing me to keep all the PCs and NPCs in one place. With all this in mind something I’m looking for other ways to record what is going on, which has been prompted by our current Dresden Files campaign. We’ve just started the final adventure of the trilogy we’d aimed for and as the GM I’m now trying to make sure everything connects together properly, especially the random elements from earlier adventures I’d introduced without knowing exactly how they fitted in (this is a big part of my GMing style, I’ll add something then adjust my existing idea of what’s going on to account for it). 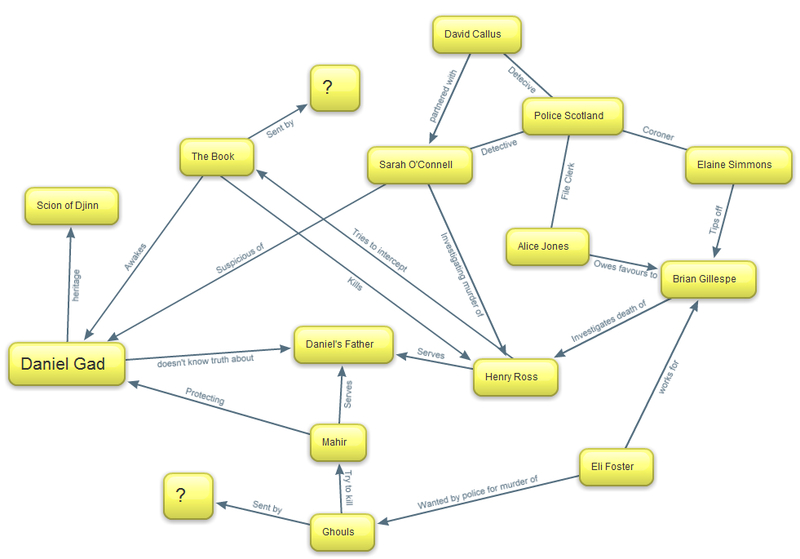 One of the best ways I’ve found to do that is through mind mapping, as I can just list out the elements and connect them together. Normally I do this in my trusty notebook but in the last few days I’ve started to look at web options for doing so, at the moment I’ve settled on using bubbl.us, so that my players can also see the results. The above is the resulting map from the first adventure. For an outsider it won’t explain anything that is going on but I hope that for the people involved it will serve as a good reference point to remind us of the connections and what happened during the adventure. The best bit of course is that between sessions I can simply add extra bubbles as ideas come together, or delete them if I change my mind. I’m curious though, what other ways do people use to manage their campaigns? Or do you have any software you’d recommend for doing so? When it comes to running campaigns I have to admit that for a long time I’ve had a problem when it comes to scale. Simply put as a GM I tend to think big and long term, with multi-part story arcs that will take dozens of sessions to complete. Part of that stems from my introduction to tabletop gaming, brand new to RPGs I joined a new Torg campaign run by an awesome GM. The campaign followed the official storyline that was published when the game first came out and while I only played in it for the first year it ran for over four years right up until the final confrontation with the Gaunt Man himself. When I left the game I did so to start GMing for the first time, with my first campaign returning to what I knew, the very Torg adventures I’d played in the year before. While that campaign did reach a conclusion it wasn’t the one I’d hoped for, though it was epic in nature. Since then I can think of only a handful of campaigns which have wrapped up satisfactorily and of those that haven’t most have fallen apart after 6-10 sessions due to players conflicts. Almost every time those campaigns have fallen apart with little of the world and larger campaign revealed to the players. The most recent example of this is the Legends of the Five Rings campaign I was running, while the game had completed a short self contained adventure (the first part of which is detailed here) the adventure ended with the party learning only that the events had been orchestrated by an outside faction. They never learnt who or why and more importantly they never got the chance to stop them. So with my current Dresden Files campaign I’m taking a different approach, that of Go Achievable and running it as a series of discrete adventures each for around 3 sessions in length. Most importantly I’m aiming to make each adventure almost entirely self contained, so should it fall apart there shouldn’t be dozens of hanging plot threads left. The most difficult bit though is trying to be concious of the pace of the game, knowing that I need to reach a conclusion within a short time period. It’s a bit of a challenge at the moment but hopefully it’ll work out in the long run.